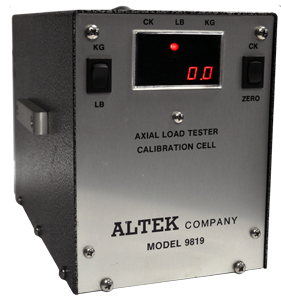 The 9819 Axial Load Tester Calibration Cell is used to calibrate the Altek family of Axial Load Testers. It can be used to calibrate both fixed platen and adjustable platen models. The 9819 is placed on the lower platen of the Axial Load Tester to be calibrated. With the Axial Load Tester in calibrate mode and pressure applied, the value on the 9819 calibration cell is compared to the value on the Tester display and the Axial Load Tester is adjusted (if necessary) to match the value displayed on the factory calibrated and certified 9819.